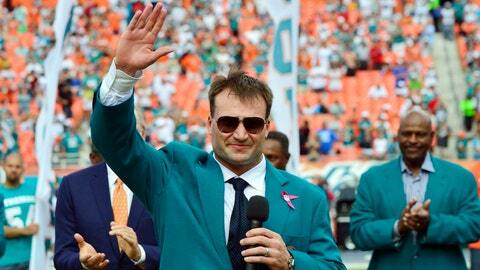 Linebacker Zach Thomas is one of the greatest finds in Dolphins draft history. Earlier in the week, FOXSportsFlorida.com looked back at the Dolphins draft history and picked the 10 worst draft picks. Today, we take a look at the brighter side of the draft, the picks that provided the Dolphins with the most value. What constitutes a value pick? Combine how the player performed for the Dolphins in regards to where he was picked in the NFL Draft. Roby made two Pro Bowls and was named All-Pro once during his tenure with the Dolphins. He spent 10 seasons with the Dolphins and ranked in the top 10 in the NFL in most major punting categories during that time. After Miami, he would play for Washington for two seasons, where he made the Pro Bowl and All-Pro team one more time before seeing his career end four seasons later. Although not the best value pick on this list, it was certainly a good pick for a sixth rounder. Andrew Goldberg takes a look at the biggest draft mistakes the Dolphins have made. Wyoming isn’t known as a football school in the modern era, but Kiick was one viable NFL player the school produced in the ’60s and ’70s. The former Cowboy had a great start to his career, making the Pro Bowl in each of his first two seasons. In his second season, he led the league with nine rushing touchdowns. He was the primary starter for the Dolphins for four seasons and finished with 3,759 rushing yards and 29 touchdowns on the ground in a career that spanned nine seasons. He also caught 233 passes for 2,302 yards and four more touchdowns. While Blackwood did not reigister a stat during his rookie season, he became a full-time starter in his second year. He would spend all nine seasons of his career in Miami, starting 106 games. Newman took a little while to make an impact in the NFL, starting just 25 games over his first six seasons. As he entered his seventh season, however, he became one of the best guards in the league. He started every game for the Dolphins from 1979 to 1984 and was voted to the Pro Bowl four times during that span. In all, he started 113 games over the course of his 12-year career, all with the Dolphins. 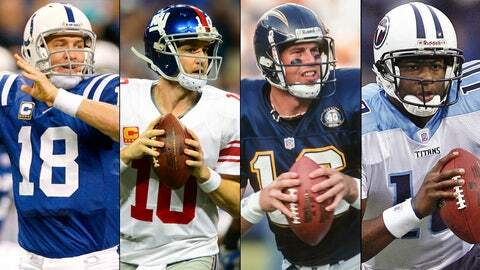 Ken Hornack takes a look at the quarterbacks selected in the top 10 of the draft over the past 20 years. Cross was one of the better pass rushers in the NFL during his eight seasons in Miami. He recorded three double-digit sack seasons, including 11.5 during his only Pro Bowl season in 1990. Cross finished with 59.5 career sacks and started 107 games for the Dolphins. Cross had 10 career forced fumbles, seven fumble recoveries and 365 tackles. Brown was a little known prospect out of Maryland, recording four interceptions for some pretty mediocre teams in College Park. But the Dolphins took a flyer on Brown, and they were rewarded with a surprise. Did Brown make Pro Bowls or All-Pro teams? No. He did, however, play eight seasons in Miami and recorded 16 interceptions while starting 88 of the 122 games he appeared in. That is pretty good value for one of the final picks of the draft. Cox started 13 games his rookie season, recording 61 tackles and two sacks. He excelled early in his career, earning three Pro Bowl invites during his five seasons in Miami. His best season came in his second year, when he had 127 tackles, five forced fumbles and 14 sacks. He spent only five seasons with the Dolphins before playing for the Bears, Jets, Patriots and Saints over the course of the remainder of his career. Clayton came into the league the same year the team drafted a quarterback by the name of Dan Marino. The two paired up to become one of the most prolific QB-WR combos in NFL history. In 1984, he set the record for most TDs receiving in a single season (18). It was later broken but still ranks as the third most in a season in NFL history. In 10 seasons with the Dolphins, Clayton caught caught 550 passes for 8,643 yards and 81 touchdowns and was chosen for five Pro Bowls. Paired with Marino he had five season with at least 1,000 yards receiving and four seasons with double-digit touchdown receptions. Scott proved a dangerous return man. His first season he averaged 10.7 yards per punt return, including one returned 77 yards for a touchdown. In 1971, he led the league in punt return yards with 318. But Scott made his mark on defense, starting every game he ever played for the Dolphins. He made five Pro Bowls and two All-Pro teams while in Miami, picking off 35 passes in six seasons with the Dolphins. Thomas may be the best selection in Dolphins history. He joined Jason Taylor, Patrick Surtain and Sam Madison as the heart and soul of the Dolphins defenses of the late 90s and early 2000s. He compiled more than 1,000 tackles in his 12 years in Miami. He also had 19.5 sacks and 17 interceptions during that time. He made seven Pro Bowls in eight years and was named All-Pro five times.